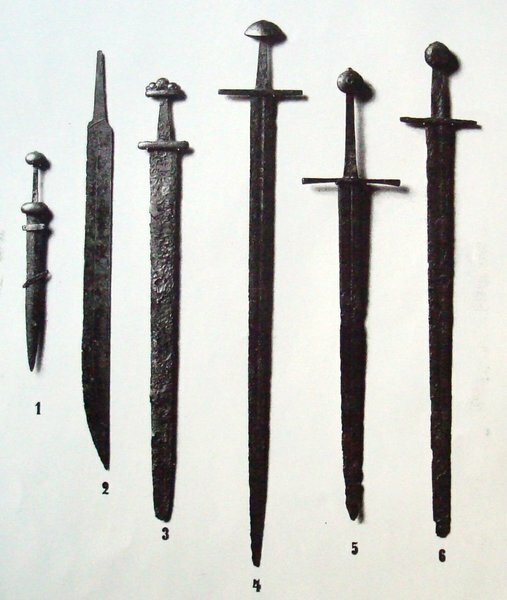 Forum Index > Historical Arms Talk > The swords of Søborg - from Iron Age to Middle ages. 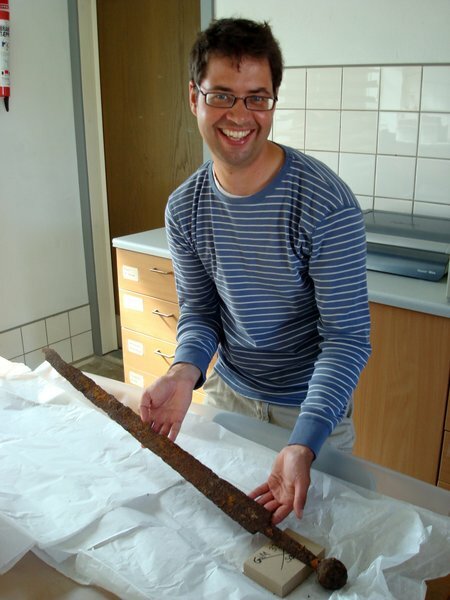 Posted: Thu 11 Sep, 2014 7:34 am Post subject: The swords of Søborg - from Iron Age to Middle ages. It is possible that the “Archbishop of the North“ Eskil of Lund (1137-1177) [a personal friend of Bernard of Clairvaux and buried next to him] had build Søborg Castle in early 1100's and he might also have dwelt there occasionally since the massive Cisterciensian “Esrum Kloster“ is close by. The castle was destroyed during the “Grevens Fejde“ [1534-1536] in the civil war between those who wanted to reinstate the former Kalmar Union King Christian 2 and the protestant Danish wanting Duke Christian of Oldenburg as King [the son of King Frederik 1]. Duke Christian won and become from 1536 Danish/Norwegian King as Christian 3 & made Lutheranism the state religion in Denmark/Norway. In Sweden Gustav Vasa had earlier also rebelled against Christian 2 (1520) and broke Sweden away from the Kalmar Union and Frederik 1 had ousted Christian 2 from Denmark in 1523. Around Søborg (castle, lake and fields) a lot of weapons have been found: Most from the middle ages, but also Iron Age and Viking age times. So far the count is 14 sword, 14 spearheads, 1 halberd and 22 axes (some as old as 300 AD). As it can be seen you have a gladius, a seax, a viking sword and three middle age ones (where number 4 is the “albion“ one). The viking sword is on the current traveling Viking exhibition. Also in 2010 a new find was announced (it had been found by a farmer plowing his field in 1950 and had been in his loft until given to Gilleleje Museum in 2010): It is 95 cm long & 6 cm wide where broadest and apparently of good quality smithing and with good balance. If one has to be really romantic: Maybe the “number 4“ was the personal sword of Eskil of Lund and when he retired as Archbishop and became a monk (1177) he threw the sword into the lake and went to Clairveux where he died in 1181/82. He was born in around ~1100 and must have been a popular storyteller of the past for the younger monks down there - especially about St. Bernard. Eskil had also visited Temple Grandmaster Bertrand de Blanchefort in 1162, so he had very strong ties with the Cisterciensians and the Templar Knights. Edit: It seems that Eskil lost the castle to Danish King Valdemar the Great in 1168 during a struggle between Archbishop and King, so it's more likely that maybe the sword was dumped in the lake during that conflict! NB: Fjederstål og hærdet (spring-steel and hardened). Ildsmedens version is only 95 cm long (same as the new sword from 2010), whereas the Albion version is 109 cm probably as the original. Albion's Soborg has fascinated me, and I hope to buy it soon. Thanks for the pictures and information of the original. The viking sword and sax are very interesting. Does the sax have inscriptions? And the gladius looks well-preserved. I wonder how it ended up there. I would certainly buy the Albion version if it had a more period accurate silver inlay. Though, I recognize that using this faux-inlay was necessary in a production environment I can't help but feel disappointed. Good point, I understand that disappointment certainly. I guess I feel that the other exactitude involved might make up for it versus a reproduction made by someone who could not handle and measure it as Peter Johnsson was able to. Well, I can't say it's next...but it is certainly a contender for the next sword. Unfortunately very little information is available from the net and I don't own the old digging reports of Søborg Castle. Boye, Vilhelm 1882. Fund af Gjenstande fra Oldtiden og Middelalderen i og ved Søborg Sø. København 1882. Smidt, C.M. : 1930. Søborg. Nationalmuseets Arbejdsmark 1930, side 5–18. København. But I think the Iron Age weapons were found in the lake nearby. So from that period they are likely offerings of some kind (at least the ones from the lake) as the other lake deposits found around Denmark from the Iron age. The viking sword could be from a burial. Many of these weapons are likely found a long time ago and later given to the museum, so the actual place of finding is unknown (only general area). I don't own Ada Bruhn Hoffmeyers book from 1954 “Middelalderens tveæggede sværd“, so I can't really comment on the other middle age swords (5-6) either [but likely from castle excavation as well]. What is interesting though is that you have swords and axes found from Roman Iron Age right until the Middle Ages in the same area. It is on the bottom of page 41 in this publication about the Cultural History of Northern Sjælland. Too bad not much remains of Soborg castle, it would be nice to see a museum or something there. I have been to Helsingor just nearby twice but was not aware of Soborg. Hopefully I will get back to Denmark in a couple of years and see some of the museums. Yeah it's not so impressive what is left. So it was apparently pretty demolished in the 1500's to an extend that the town also lost is status as a marked town and is today just a small little village. The nearby Esrum Kloster (Abbey) is more impressive, even though only part of it has survived. That has museum, restaurant, own beer and middle age marked: Here is the plan for 2015, 20-21 of June. The map on page 41 shows the central places in the area during the middle ages: The churches (red squares) the marked towns (Blue circles; Slangerup, Søborg and Helsingør), the two abbeys (Esrum Kloster = Cisterciensian, Æbelholt Kloster = Order of St. Augustine and the castles (9 in all). The Danish National Museum has now uploaded a picture of the "Søborg Sword" (the one Albion reproduced). Found it by chance since their info doesn't state finding place (but it has all the correct inscriptions and size). A perhaps even more impressive sword than the Søborg one (?) has been found in 1943 at nearby Esrum [Esrum Møllegård part of Esrum Kloster] at the lakebed of Esrum Sø (Lake Esrum). So this can be regarded as another lake weapon sacrifice/gift as seen at Søborg Lake or Tissø Lake. Dating: Perhaps latter part of the 1100's ? Blade length: 99,5 cm (for a 1-handed sword that is pretty impressive). Was found with a wooden sheath, that wasn't conserved. Ornamentation on the Esrum Kloster sword. Some scholars have dated it to 740-830 AD. That seems very early for a sword of this type, aren't most type S's from the 10th century? Is there some specific evidence to support such an early date? Thanks for your other posts and photos, by the way. Yeah I found that a "recent examination" showed this dating [page 233-234 in "The Iron Age on Zealand. Status and Perspectives"]; but they don't cite any papers. I would definitely think it's in line with the sword type found in Danish chamber graves from around ~950 AD and type S is one of the most prominent from the Danish territory. Thank you for posting these!!!! Do you have any other information on the Esrum Sø sword? I will be commissioning this one at some point. I love it!!!!!! Have tried to find some info, but beside the page on the National Museum I have had no luck. Apparently it was found in 1943 when a worker [Poul Poulsen] was digging a ditch around Esrum Møllegård. It was found on a meadow close to a lakeshore [I assume it must be Esrum Lake; since Esrum Møllegård is not positioned right up to any lake]. The sword probably belonged to a prominent figure in Danish society, who visited the Abbey and gave the sword (as thanks?) to the waters. The water levels were probably higher then, so it was thrown or put into the lake water. The Esrum Kloster (Abbey) was ordered build by Archbishop Eskil of Lund in 1140 as a Benedictine Abbey, but was converted in 1151/53 into a "daughter" abbey of Clairvaux for the Cisterciensian Order. Archbishop Eskil of Lund was a personal friend to St. Bernard of Clairvaux and ended up being buried next to him in Clairvaux. In front is the Church that originally should have been as long as the Abbey (104 meters) behind it, but ended up being shortened. The red building was once a part of the east-wing, but it's the only part that has survived: The Abbey was used as building material for Rosenborg Castle in Copenhagen. The other building to the right in black and white with red tiles is Esrum Møllegård. It is speculated the surviving Abbey building was used as a hospital or home for the Abbot. I was just going to post the same thing. Exceptional sword. By the way 99,5 cm blade on a clearly 1-handed weapon seems pretty extreme. As I don't know about how it handles, could it be for cavalry to have a long downward reach? Do you know of any other examples that equals that length? I had a singlehander with 99cm long blade. It was a converted Del Tin handle and a half XIIIa blade. It would have handled great if distal taper was more dramatic. This way it was not really responsive but it cut great. Strikes were not that difficult to make, but recovery was slow. William Swiger owns it now. This Esrum sword looks like it has more profile taper and surely more distal taper than that Del Tin has. I believe it handled very well. But it certainly was made with mounted use in mind. Do you have any more information on sword #5 in the first picture of your first post? It looks to have the longest grip of all of the swords while being the shortest of all the blades with the exception of the gladius and seax. Is it possible with this particular sword that the blade had broken and reshaped to prolong the life of the blade? Very interesting information and great pictures! Thank you for posting.